This little girl is Bernie Gerathy who lived three houses away from ‘The Blind Man’s Shop’ on Lower Carnlough Road. That’s what we called the shop back then, I don’t know what we’d call it today. 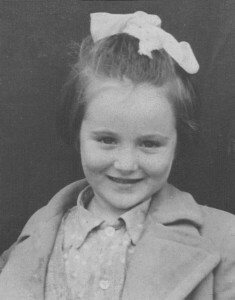 Bernie was one of those very lucky Cabra West children that had daily access to the Cabra Hills by climbing over her back garden wall. She was like the ‘Mad Hare’ once she got over that wall. She’d be away in a shot down to the railway carriages where she got up to all sorts of mischief. She would spend a whole day with her pals playing games of Hide and Seek and chasing each other. Of course children back then had bundles of energy and could run forever. Bernie started working when she was thirteen years old and is still on the go. She is one of the all time greats from Cabra West.